The video of the attack showed the two assailants confronting the victim, who was wearing a turban and walking alone on a sidewalk. The pair are seeking kicking the man and knocking him to the ground, before robbing him and spitting on him. Tyrone McAllister, 18, whose parents assisted police in tracking him down following Monday's attack. 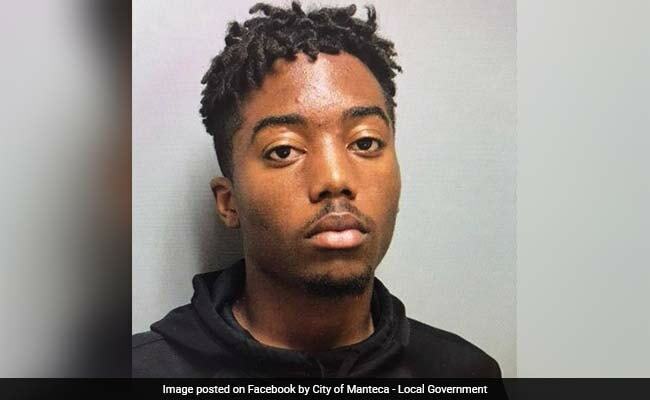 Tyrone McAllister, 18, whose parents assisted police in tracking him down following Monday's attack in the town of Manteca, about 75 miles east of San Francisco, was arraigned in San Joaquin County Superior Court and ordered held on $300,000 bond. Following McAllister's arrest on Wednesday, the police department of Union City, just outside San Francisco, posted a an open letter on its Facebook page from its chief, Darryl McAllister, acknowledging that his son had been arrested in the attack. "Words can barely describe how embarrassed, dejected, and hurt my wife, daughters, and I feel right now. Violence and hatred is not what we have taught our children; intolerance for others is not even in our vocabulary, let alone our values," the police chief wrote. The police chief said he and his wife had helped the Manteca police locate his son, who the elder McAllister said "began to lose his way a couple of years ago while he was a juvenile, running away and getting involved in a bad crowd." "The behavior we witnessed on the video does not represent who we are as a community," District Attorney Tori Verber Salazar said in a brief videotaped statement of her own that was posted after Friday's arraignment and translated into Punjabi.